As we know faster is better but how much faster is better is still a question, but not in the case of Intel new memory technology which makes your devices super fast than ever before. As our old storage technology mechanical Hard Drives (HDD) are really slow as compared to Solid State Drives (SSD). There is much technology which uses HDD and SSD side by side in one drive solution like Apple FusionDrive or other’s, people also store booting OS in SSD so their device or app will boot up really quickly so it will run quickly but with small size. But Intel came up with something which will change the future of computing: Optane memory is an option for it. Intel has mixed up RAM and traditional storage to make storage process faster, so this provides low latency. The user will get faster Data Input and Output. Unlike traditional RAM, Optane is non-volatile and can retain data once powered off. So this memory gives the advantage over fastest memory solution over NVMe SSD which you can buy now. Intel Optane memory is 4.42 times faster than a ‘NAND’ memory based NVMe SSD in terms of Input and Output Operation per sec and has 6.44 times less latency. While comparing Optane memory with SATA based SSD Intel Optane crosses over 10 times in speed. The technology behind Intel’s Optane memory is developed with Micron that the company is calling 3D XPoint (that’s “crosspoint”). 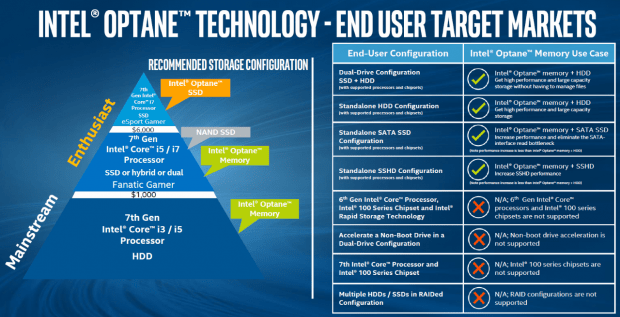 So which means Optane can have more memory than NAND flash SSDs in same space. Optane memory is shipped in the form of m.2 size drives that slot directly into the motherboard. Intel Optane memory uses the latest technology of Industry like Machine Learning so Optane memory intelligently learns on which applications and games you run most frequently and over time speeds up how quickly they load. Optane Memory learns while you are using it and also reduce app loading time as you use the app frequently. Intel Optane memory has the smaller amount of RAM memory and the larger amount of HDD so the budget of the drives become more feasible. During the test, Intel Optane memory can boot up Windows faster than SSD. Intel made compulsion that user must use new 7th Gen Intel CPU and higher to benefit this memory type, your motherboard also has the m.2 slot for this device compatibility. You’ll also need motherboard types like B250, Q250, H270, Q270 or Z270 to support this drive. Intel has made only few memory option for Optane you can use 16 or 32GB option so if you are enthusiasts and want 1TB of Optane memory you’ll have to wait for a while, you will also not drop recent fastest standard NVMe SSD if you have in your system. If you want the fastest memory you’ll have to pay more and Optane memory is really expensive at this point in time you’ll get the 16GB module which will cost around 50$ and 32GB will range upto 80$. Both sizes are on sale right now, and you can order them from a number of retailers. While when technology becomes old it will surely be cheaper and more affordable to buy. Optane memory will make the mass appearance into 2018 to laptop, PC or memory sticks. Manufacturers like Dell, HP, and Lenovo are already getting on board and offering Optane option inside their laptops and desktops. So it is exciting to see how far this memory technology can help the user to store data more reliable than HDD or SSD.